← The Coastal Path Gets Printed! 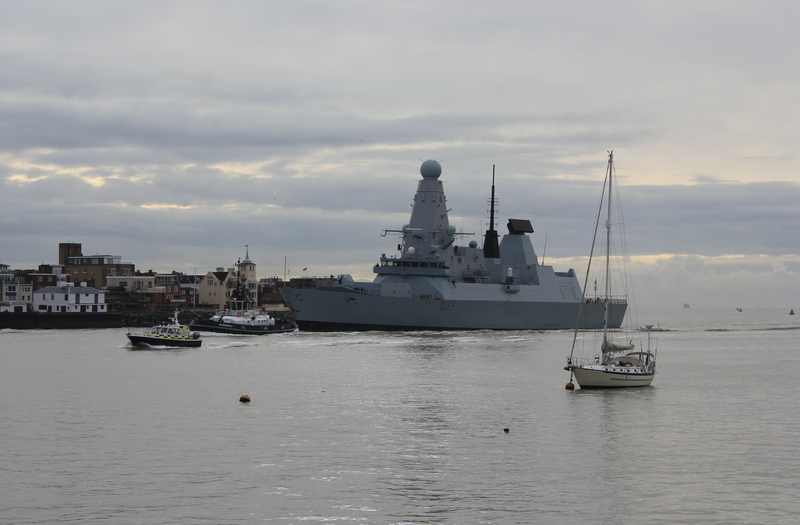 As we set off on our walk today we were greeted by HMS Dauntless as she entered Portsmouth Harbour. What a strange and impressive looking ship! HMS Dauntless is a Type-45 Destroyer, specialising in protecting the British fleet from air attack. That spiky round thing which looks like the giant model of a virus is actually a multi-function radar. In fact a lot of the protrusions you can see are radars or other communications equipment. Launched in 2007 and commissioned in 2010, her home port is Portsmouth. We stood and watched her slowly make her way to port. As we headed off south towards the marina we passed a memorial. 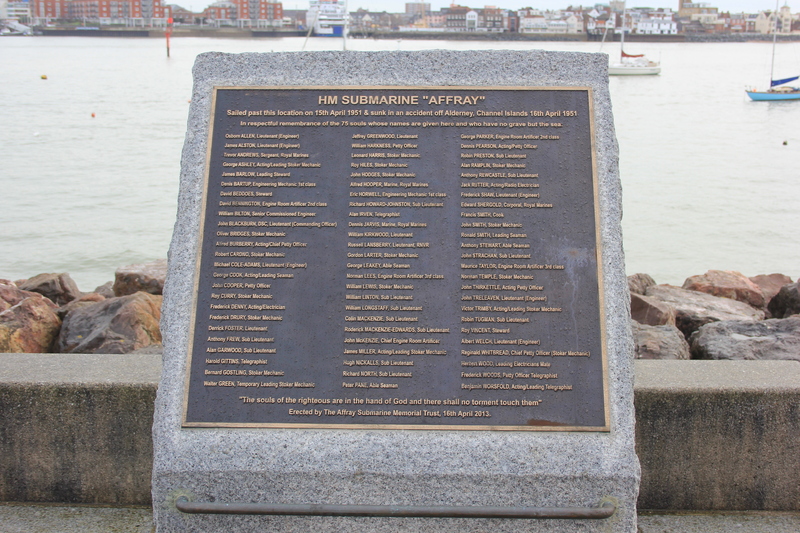 This memorial remembers the men of HMS Affray. At 16:00 hrs on 16 April 1951 the Affray set out from Portsmouth on a training exercise. At 21:00 hrs she radioed in to confirm her position and indicated that she was preparing to dive. That was the last anyone heard from her. When she failed to radio in the next morning a search was immediately instigated. More and more ships joined, and eventually 24 vessels from four countries were involved in the search. It was estimated that if the crew survived whatever had sunk Affray in the first place, they would probably not survive for longer than 48 hours. During this time several vessels heard faint but unreadable signals, presumed to be transmitted from the Affray. On 18 April at 14:39 hrs the submarine HMS Ambush picked up a clear reading in morse code, presumed to be tapped out on the hull of Affray: “We are trapped on the bottom”. That signal was the last heard from HMS Affray. The search was abandoned the following day by all vessels save for HMS Reclaim, a specialist submarine rescue and diving ship. It was two months before the Affray was finally found, on 14 June 1951, some 40 miles from her estimated diving position and under 258 feet of water. The Affray was never recovered; it is now illegal to dive there as the wreck is a controlled site under the Protection of Military Remains Act 1986. The exact cause of the sinking has never been discovered. The official theory is the snort mast broke, allowing water to rush in at 13 tonnes per second (the snort mast is a submarine’s snorkel, allowing the submarine to operate under water whilst still taking in air from the surface. If you have ever watched a film of a submarine diving, the snort mast is one of the last things you see disappearing under the water). However, not everyone was happy with this finding, including some of the Affray’s crew who were not chosen for the mission. Some have said the Affray was not seaworthy and should never have sailed in the first place. Even sabotage has been hypothesised. Whatever happened, the HMS Affray was the last British submarine to be lost at sea. The 75 men who were lost with her were not recovered and remain with their ship. Their memorial was unveiled on 16 April 2013, 62 years after the disaster. 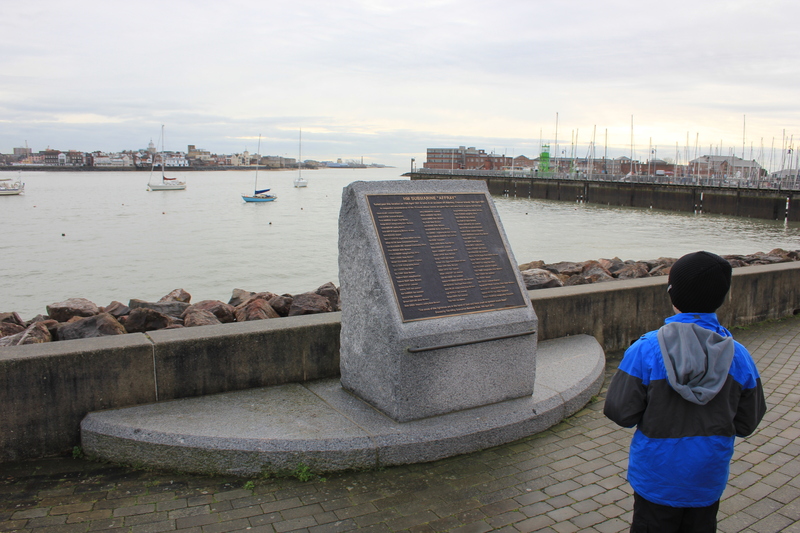 This entry was posted in Hampshire and tagged coast, disaster, Gosport, Hampshire, HMS Affray, memorial, snort mast, submarine, travel, walking. Bookmark the permalink.